BROWNTAIL MOTH Readies for Outbreaks: Maine and Beyond. With the threat of another bumper crop of BROWNTAIL MOTH (Euproctis chrysorrhoea…Lepidoptera), a moth in the family Lymantriidae. looming, a regional approach to finding solutions to the nuisance caterpillars and directed their town manager to work on forming a coalition to combat the insect. Maine Forest Service entomologist Charlene Donahue informed more than a dozen local communities in October that she expects a return of the pest, hoping to give property owners and municipalities time to survey their lands and take action. Contact with the poisonous hairs found on the caterpillars can cause a skin rash similar to poison ivy and some people suffer respiratory distress from inhaling the microscopic hairs. Pam LeDuc, Topsham’s parks and recreation director, said town staff was asked to research the browntail moth issue. They met with town arborist Kyle Rosenberg, and then Donahue, who both provided recommendations. “Topsham is probably, as you can see by the map, the most involved community in the region, along the water especially,” LeDuc said. The town has a recreation field by the Androscoggin River, where LeDuc said it can’t spray. The only affordable option is to trim the trees. The town’s turf maintenance company would do a spray treatment at the municipal complex, the library and the Foreside Road recreation complex on the concession building side of the road, for an estimated $1,200. Acer – maple, Arbutus, Amelanchier, Arctium – burdock, Betula – birch, Carya – hickory, Castanea – chestnut, Cotoneaster, Chaenomeles – flowering quince (‘Japonica’), Crataegus – hawthorn, Cydonia – quince, Fagus – beech, Forsythia, Fragaria – strawberry, Fraxinus – ash, Geranium – cranesbill, Gossypium – cotton plant, Hippophae – sea-buckthorn, Juglans – walnut, Malus – apple, Myrica, Parthenocissus – Virginia creeper, Plantago – plantain, Populus – poplar, Prunus, Pyrus – pear, Quercus – oak, Rheum – rhubarb, Ribes – currant, Robinia, Rosa – Rose, Rubus – raspberry, etc., Rumex – dock, Salix – willow, Sambucus – elderberry, Sorbus, Spiraea, Tilia – lime, Trifolium – clover, Ulmus – elm, Viburnum, Vitis – grape, Weigela and Wisteria. LeDuc said Cumberland sprayed its most impacted streets for approximately $15,000 — both on private and public property. Cumberland considered an aerial program, Roedner said, but you run into issues when several property owners opt out, as well as the proximity of affected areas to the river. 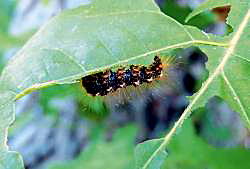 Selectman Dave Douglass said board members have been contacted by multiple people about the browntail moth caterpillar outbreaks. Selectman Bill Thompson agreed there should be a regional effort, and with local municipal and state officials involved in the discussion.